A lot has transpired since the last post. 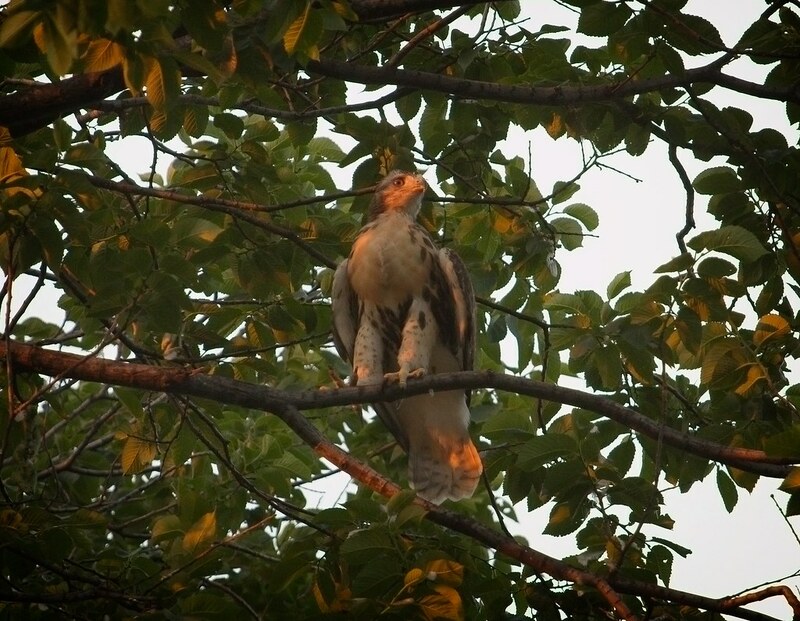 To recap, the Tompkins Square red-tail baby fledged the nest tree at 8:29pm on Monday, June 12. This was a surprise (to me) as I'd been there all day and the hawk barely moved. 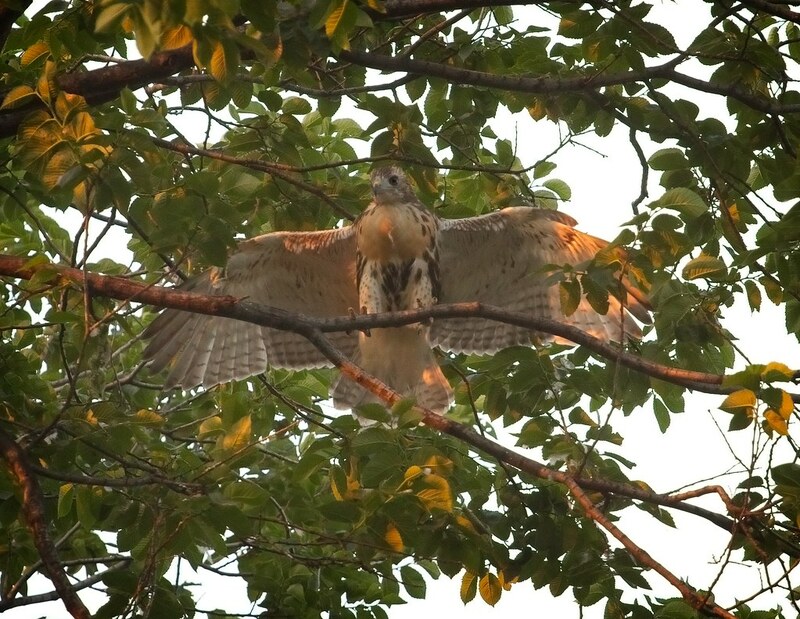 But fellow hawk-watchers saw it happen and the fledgling flew to some high branches adjacent to the Krishna Tree. 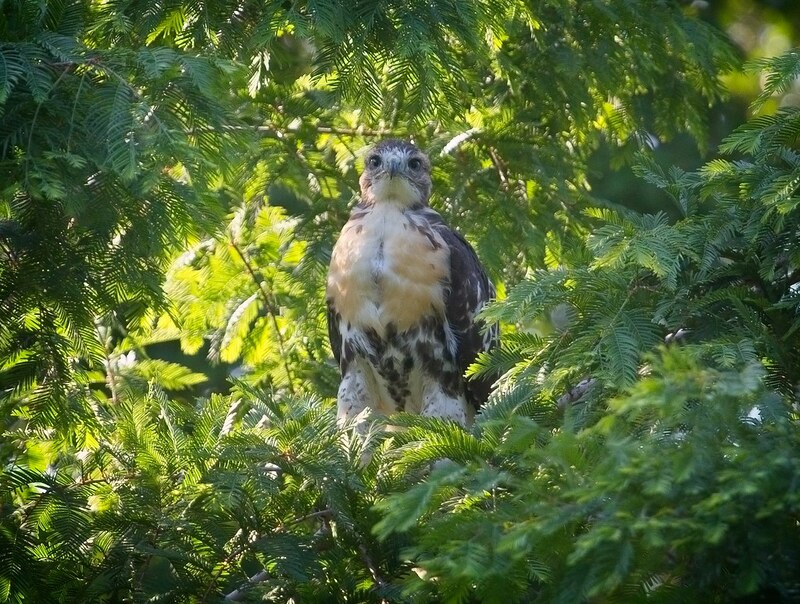 When I returned to the park Tuesday afternoon, the fledgling had made its way back to the nest tree. If there hadn't been witnesses to the fledge, I wouldn't have known it had happened. This is how the little (big) guy looked when I left the park Tuesday evening. 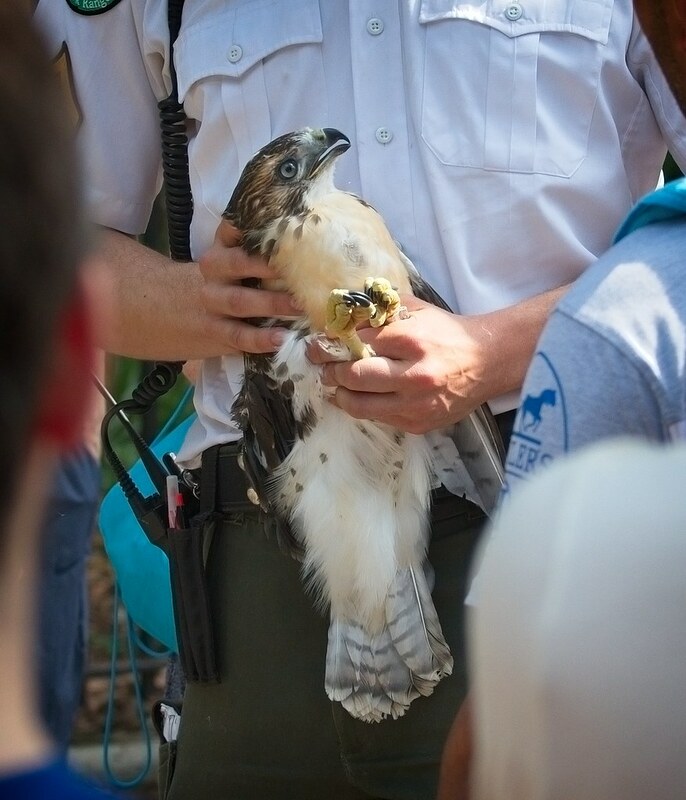 Wednesday afternoon, I received a call that wildlife rehabber, Bobby Horvath from WINORR, and the Urban Park Rangers were releasing a second red-tail fledgling in the park, so I rushed over to see what was up. 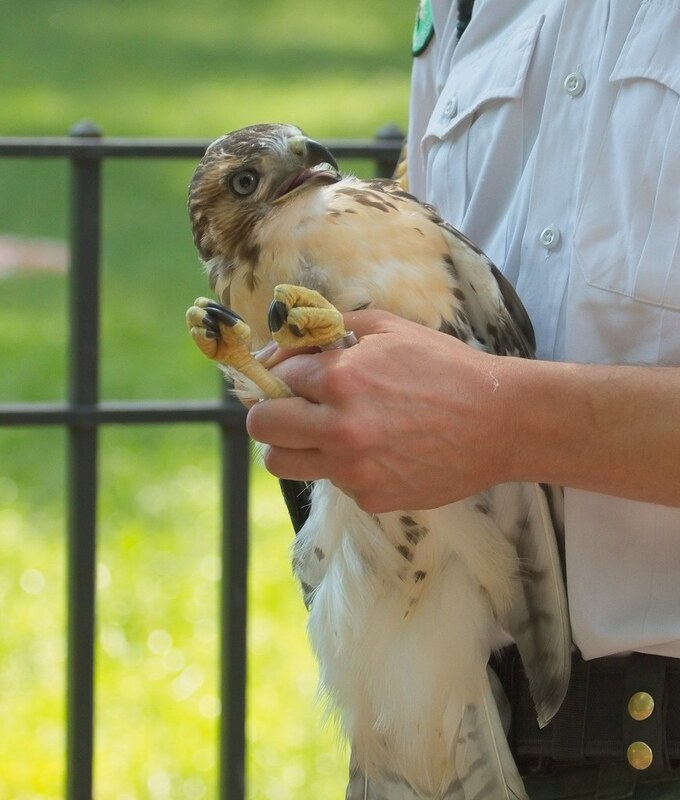 This fledgling was rescued from Flatbush Avenue in Brooklyn and had been in the care of WINORR. As it wasn't safe to release it back to where it came from, it was decided to release it in Tompkins Square with the expectation that Christo and Dora will adopt and care for it. The fledgling is a male and has a metal band on its left leg. This is Ranger Rob, also known for his rescue of Shaft. He is the super hero of hawks. Ranger Rob released the fledgling into the Steve Jobs redwood tree on the central lawn where it hopped up to the higher branches. 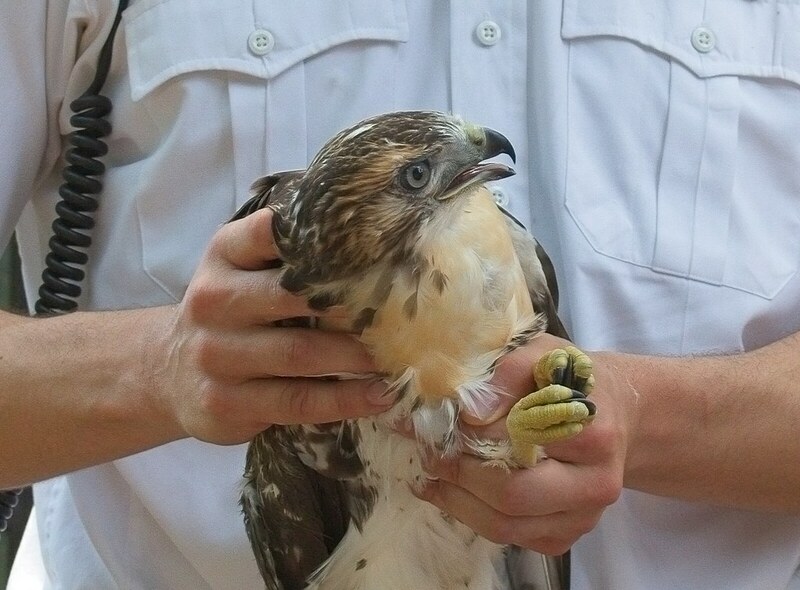 Here is a view of the banded leg. It will be an easy way to tell the two fledglings apart. 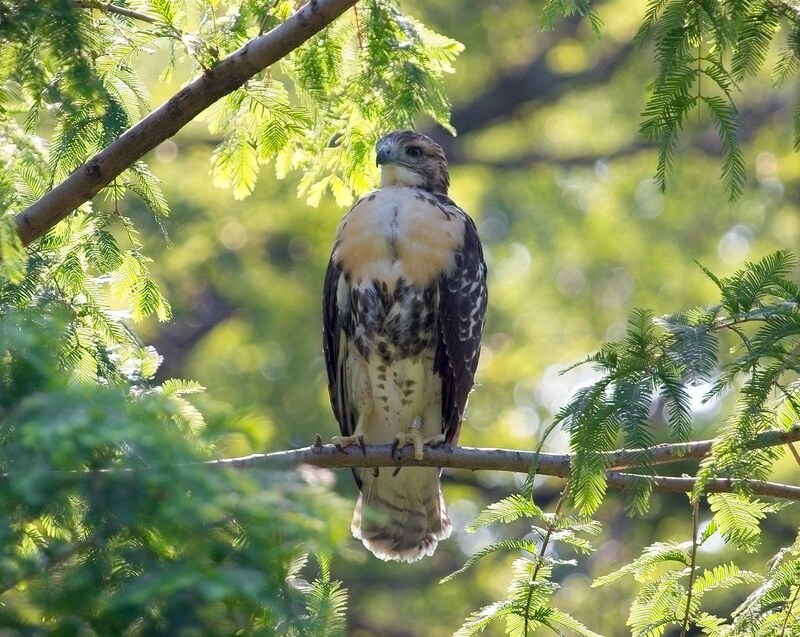 The hawk was placed in the tree around 3:45pm. 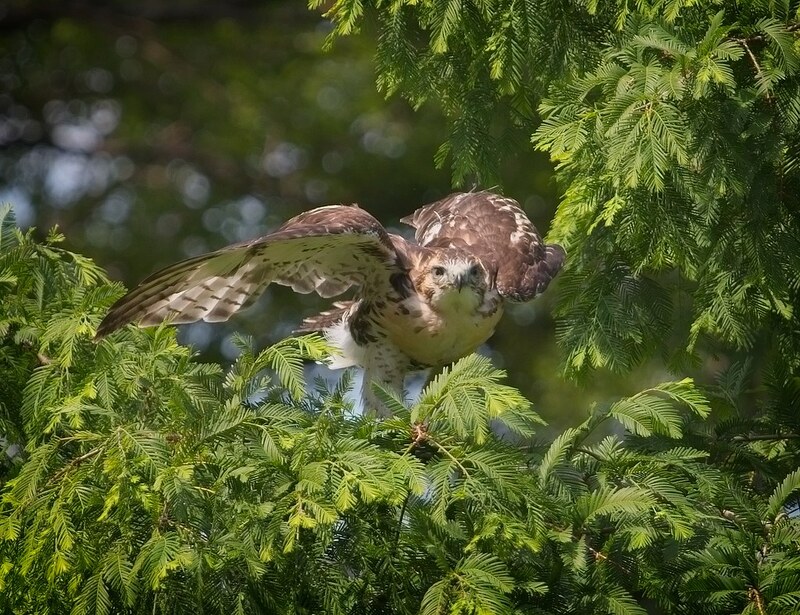 Meanwhile, the first fledgling was still hanging around the nest and Christo and Dora flew over the central lawn a few times. It was obvious they were checking out the new hawk, but were maybe wondering why suddenly they had an extra kid. I was told that when the fledgling starts to cry for food, the adults will respond and feed it. As the fledgling was well-fed when it arrived in the park, it stayed pretty quiet and the adults tended to the first fledgling at the nest. 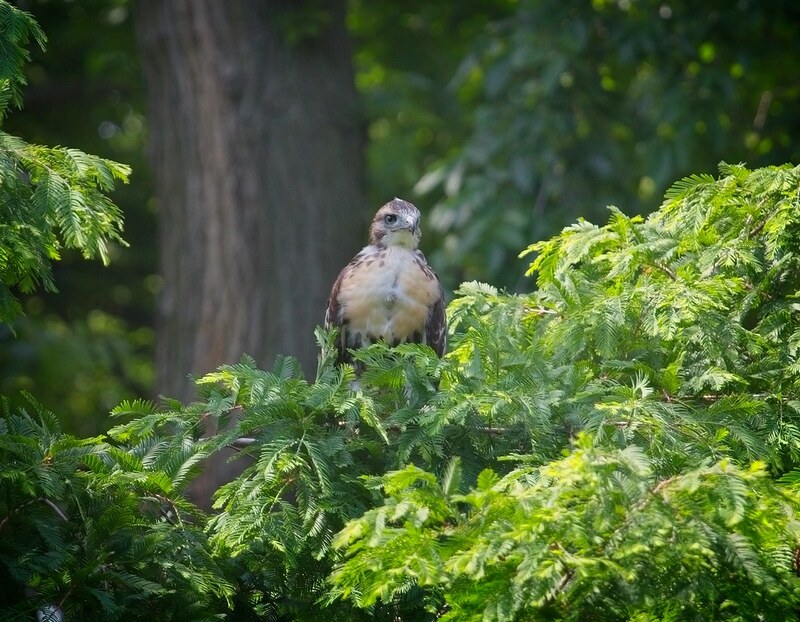 Several hawk-watchers stuck it out for a few hours waiting for the baby to cry and the adults to respond. As the sun set around 8pm and it started to get dark, I saw who I thought was Christo come flying over the central lawn. But, it wasn't Christo. It was the first fledgling! 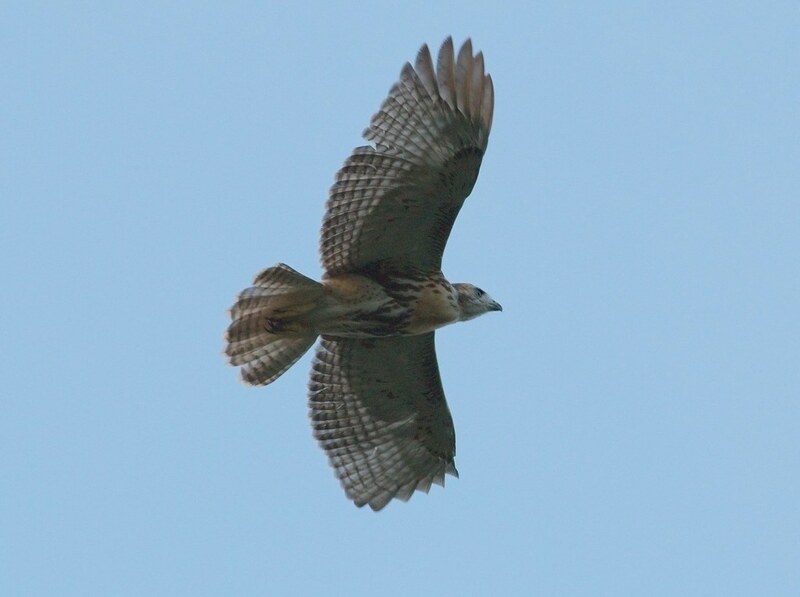 I'm pretty sure this was the second flight for the young hawk, but it was the first time I saw it fly. 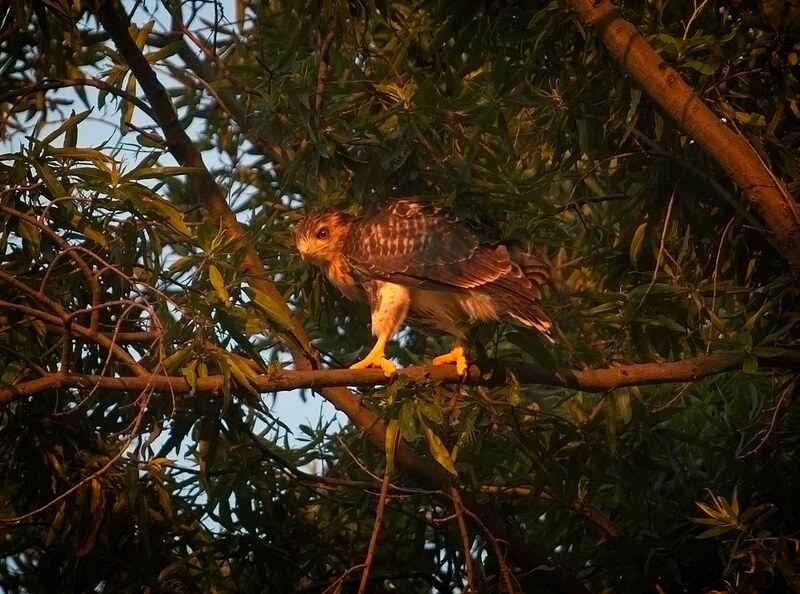 It sailed right over the redwood tree and landed high in the same willow oak as last year's first fledgling. From there, both young hawks could see each other and the one in the redwood made tiny peeping sounds - not loud enough to be food cries. Below, you can see the first fledgling's lovely tail. I left the park at 9pm as it was dark. The first fledgling looked like it was going to roost in the willow oak and I'm guessing the second fledgling stayed in the redwood. Christo and Dora were last seen in the NE corner of the park. I'm hoping they make contact with the new kid in the morning. 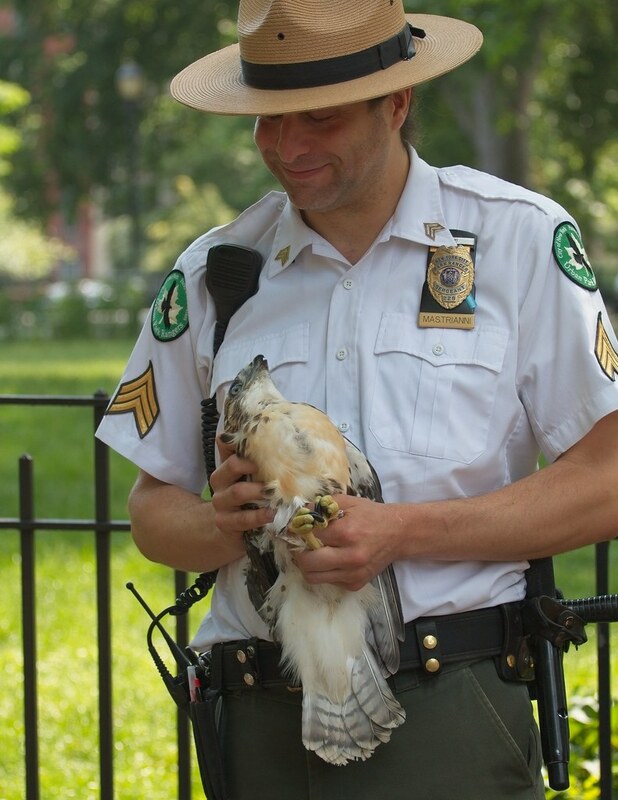 Many thanks to Ranger Rob and the Urban Park Rangers for being patient and answering a thousand questions. And special thanks to Bobby Horvath who does this work out of the kindness of his heart. 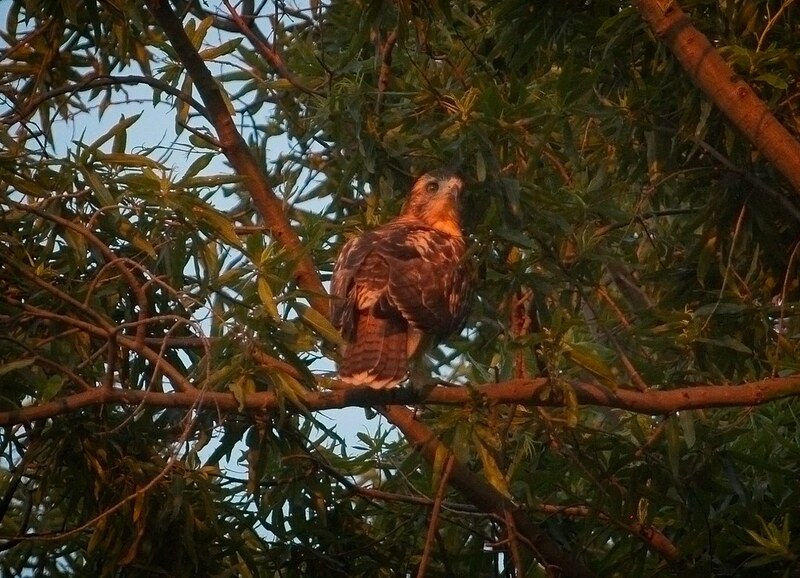 We previously featured him rescuing a hawk on the Lower East Side. Please consider making a donation to WINORR, as they are a non-profit who care for countless animals 24/7.